The El Cerrito adobe, as it was known because it was built near the north bank of El Cerrito Creek, was one of the adobes built by the Castro family on Rancho San Pablo. It was destroyed by fire in April 1956. We have photographed only one other historic marker sponsored by the Boy Scouts of America: California Historical Landmark 125, the Evans and Bailey Fight, in Modoc County. I grew up in El Cerrito and lived in that city from 1947 through 1964. 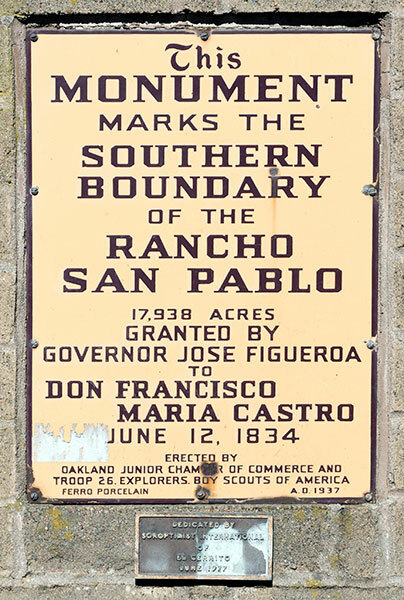 Prior to the 2002 reconstruction of El Cerrito Plaza, near the central part of the northern edge of the block containing stores (possibly at about where either Talbot or Cornell streets would intersect the Plaza if they extended that far), there existed a large plaque detailing the history of the site, including the Castro Rancho San Pablo, its usage as a gambling facility, and the fire which destroyed it. 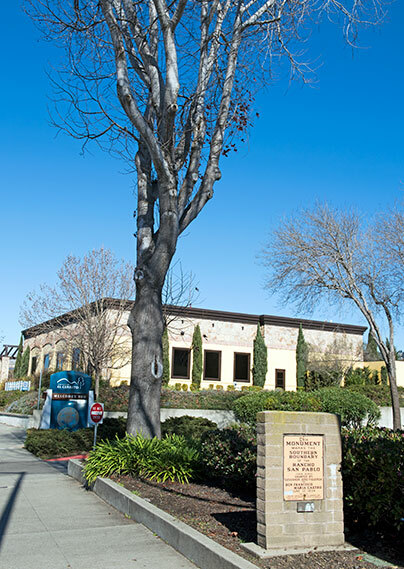 When I visited the "new" El Cerrito Plaza, I was dismayed to note that all traces of that plaque - and the site where it was - were no where to be found - presumably destroyed during that renovation/reconstruction. Restoration work on Cerrito Creek along the same north side of the Plaza (from looking at maps, I think it is actually along the boundary between the city of Albany in Alameda county and the city of El Cerrito in Contra Costa county.) I "Goggled" "El Cerrito Creek" and found a lot of information.